The 612 Cleaning Times features an updated collection of cleaning production rates while covering all of the same information as the popular 540 Cleaning Times. Brought to you by ISSA, the 612 Cleaning Times has more than 60 new cleaning times and includes a new section devoted to the ISSA Clean Standard: K-12. 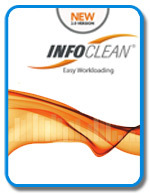 This intuitive software will simplify workloading and estimates staffing levels using ISSA’s newly updated 612 Cleaning Times. The new edition includes a return-on-investment application for equipment purchases. Preview the software here. APPA’s popular guide to custodial staffing includes the original concepts of the five levels of clean and includes information on such specialized facilities areas as dormitories, health care facilities, and more. 33 room categories in all. 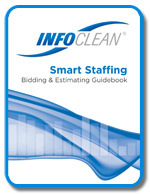 This guide provides a framework to simplify the workloading process and assist you in determining whether you have the “right” staffing levels. SmartStaffing uses a four-step process to simplify bidding for building service contractors and provides in-house managers the information needed for budgeting.